The 3 day HSE and UKAS recognised First Aid at Work (FAW) training certificate is valid for three years, after which First Aiders must either re-qualify as first aiders or cease to provide first aid in the workplace. 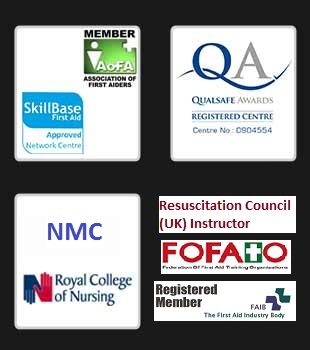 The First Aid At Work Requalification training course is required to maintain the qualification. The First Aid at Work HSE and UKAS recognised Requalification Course takes place over two days and is suitable for training a group of staff on your own premises. This training course is for those candidates who have already completed a previous 3 day First Aid at Work course and now need to requalify. If the first-aider does not retrain or requalify before the expiry date on their current certificate they are no longer considered competent to act as a first-aider in the workplace. They can requalify at any time after the expiry date by undertaking the two-day requalification course. HSE advise however, that it may be prudent to complete the three-day FAW course, especially where a considerable period – ie in excess of one month – has elapsed since the FAW certificate expired. The maximum number of candidates per course is 12. This course is available for groups of up to 12 people from £977.00. No VAT to be added. On successful completion of the HSE and UKAS First Aid At Work requalification training course and final assessment, candidates will receive a First Aid at Work – FAW Certificate valid for three years.